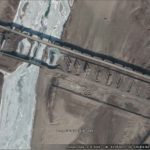 UPDATE 3 (2018-3-13): New Google Earth satellite image from January 2018 shows little has changed from October 2017. 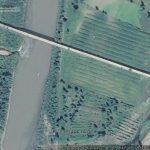 UPDATE 2 (2017-10-20): NK News captures ground level photos showing progress on bridge construction. 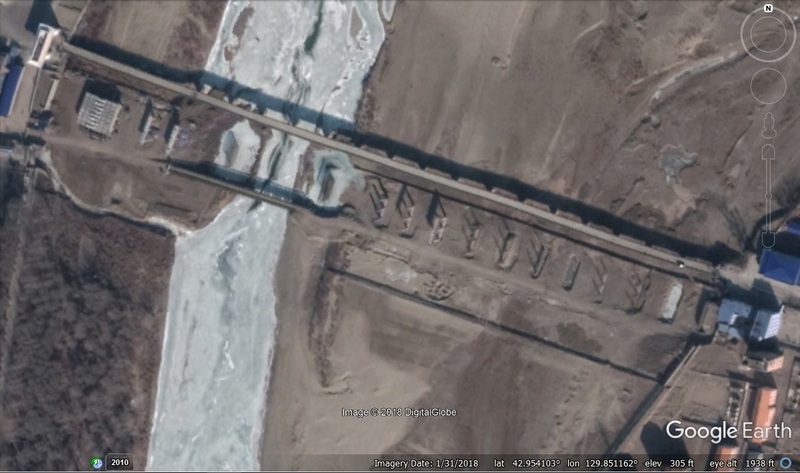 UPDATE 1 (2017-3-24): NK News reports progress on the bridge appears stalled. Construction on a new bridge over a river separating China and the Democratic People’s Republic of Korea (DPRK) has started, authorities of northeast China’s Jilin Province said on Tuesday. With a total investment of 137 million yuan (21.93 million US dollars), the 804.7-meter new Tumen River bridge is expected to open in 2015 or 2016 as a new route for bilateral trade, authorities said. The old Tumen River bridge has not been repaired for many years and is facing safety risks. However, the old bridge will not be dismantled and will be kept as a scenic spot. 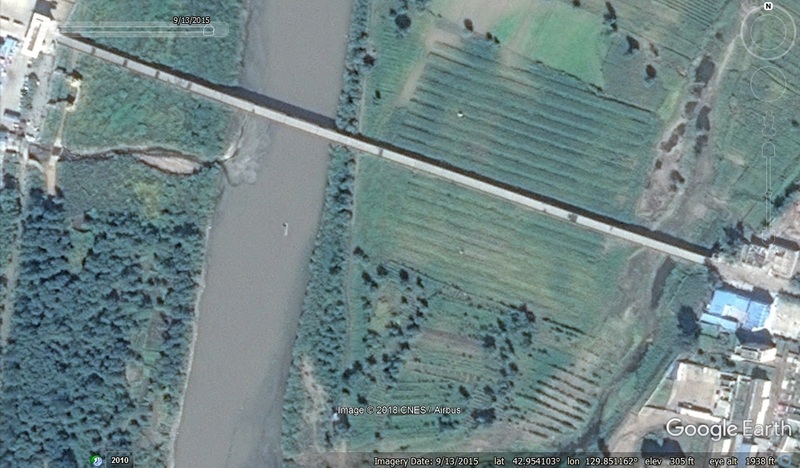 Tumen City is linked to the DPRK by both highway and railway. China will begin constructing a new major bridge to North Korea over the Tumen river, China’s state media reported Friday, in the latest sign that economic relations between the two nations remain stable despite the North’s nuclear ambition. The 804-meter-long, 23-meter-wide bridge will link the Chinese border town of Tumen to North Korea’s northeastern coastal city of Chongjin, the Yanbian Daily newspaper reported, citing the city government of Tumen. China’s central government recently gave a final approval to build the bridge, which is entirely funded by China at a cost of 137 million yuan (US$21.9 million), the report said. China has been building another major bridge connecting its border city of Dandong to the North Korean city of Sinuiju across the Amnok river, called as the Yalu River in China. North Korea’s series of provocations, including last year’s third nuclear test, have strained political ties with its last-remaining ally, China. Still, many analysts believe that Beijing will not put strong pressure on Pyongyang due to the risk of aggravating the current situation. The bridge will replace an older structure, built in 1938, which will be turned into a tourist attraction, Xinhua said. There are several other rail and road bridges linking the two countries. Chinese tourists recently started crossing into Namyang for day trips on bicycles. This entry was posted on Friday, May 23rd, 2014 at 9:56 pm and is filed under Automobiles, China, Foreign direct investment, Railways, Transportation. You can follow any responses to this entry through the RSS 2.0 feed. Both comments and pings are currently closed.